My first experience of hypopituitary dwarfism began with Max my German Shepherd who was born in 2000. His pedigree was pure gold and came from many legends of the German Shepherd world, but he came at the age of eight weeks with a hidden secret. Although I have been around German Shepherds all my life and coming from a family that bred them, this was the first time I had come across this condition. On his arrival, suspicions were growing daily that all was not well, from initially not eating as a puppy to his gradually changing appearance and of course his lack of growth. A GSD breeder I accidently bumped into while on a day trip with him and my family to the beach commented that he looked odd and later in the day as I watched and played with him on the beach he seemed to appear very fox-like in appearance. We already suspected something was not right with him, but this chance conversation finally prompted me to actually do something about it. The very next day I took him to the Vets who after close examination were equally puzzled as to what might be wrong with him. Both the vet and I searched for information and later in the week I was called in to the practice and shown some information from a very old veterinary book showing pictures of what he was thought to be and what he was about to become. My then veterinary practice had not seen a pituitary dwarf before and had very little knowledge on the subject, there seemed little that could be done for him, no information at the time was available. I was then sent away with him untreated and with an estimated life span of three to four years and quite quickly he was becoming a curiosity which felt uncomfortable. My Vet approached me a few months later in 2001 and requested that he be sent to the University of Utrecht which he had heard did research on pituitary dwarfism, this request was quickly declined as he had now become very much part of the family and we could not give him up. The breeder was next informed and I was offered my money back but they also wanted the dog back, we suspected that the dog might be put to sleep on his return, so we chose to keep him. I then had to manage his condition alone much of the information gained at that time from the Vet turned out to be in practice incorrect. As stated Max was untreated for pituitary dwarfism and rapidly lost his puppy coat at 12 - 18 months of age, putting him to sleep was never once raised or discussed with the Vet as everyone could see he was so full of life despite his rapidly disappearing coat and poor skin condition. He continued to lead a relatively long life for an untreated dwarf that of seven years of age, because he was untreated sadly he aged rapidly and looked a very old dog when he did finally reach seven. Max was always very close and a very special bond was formed between us that is rarely matched by other dogs, other dwarf owners will readily confirm this. Having not been able to let the issue of Max and pituitary dwarfism go, I thought I would try and make contact with other owners not realising that a group already existed and in fact I was both shocked and saddened at just how many other people were out there with dwarves worldwide after being told that Max was one in a million and very rare. After accidently finding Tanja Stoetman on the internet, rapidly one thing led to another and I have since become the UK Ambassador for the Saartje Foundation for Pituitary Dwarfism in dogs to hopefully be there for others facing the same issues to pass on advice and information about this condition and just as importantly pass on my wealth of day to day knowledge in caring for a dwarf. Until relatively recently nothing much could be done for a dwarf in terms of treatment, things however have changed a little since my dwarf dog. A variety of hormone treatments have now helped many dogs while a pituitary dwarf was once bald except for head and feet and quite frankly very unappealing except to the dedicated owner who loved them for what they were, a very sick dog! Today they can often be helped to retain their coats and ease some of their symptoms although not cure them. But as we increase awareness of this terrible condition another problem has arisen in that the general puppy buying public may see them as what appears to be an appealing ‘forever puppy’ particularly so now that their coats can be maintained and demand may actually increase as unscrupulous breeders try to breed specifically for them in an attempt to make money at the expense of the dog. The attraction of having a cute ‘forever puppy’ that is relatively rare and unusual will possibly be a strong attraction for some breeder’s intent on making money and buyers who want a dog that is unusual but without considering the dog’s health and welfare. This would be disastrous for the breed which already has enough health problems as it is, this is why the various Breed Councils, Kennel Clubs and other guardians of the breed around the world should act now before it is too late, or at the very least officially recommend DNA testing and hence discourage the breeding of carriers with carriers of the faulty gene to anything other than to a clear. 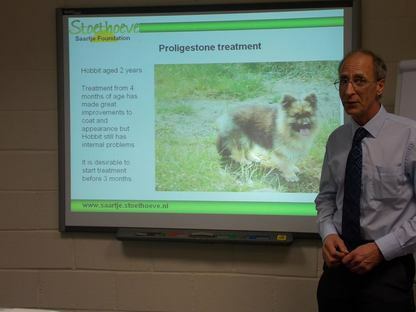 As a qualified University and College Lecturer of many years I written many published papers on pituitary dwarfism am able to offer presentations / seminars on dwarfism to any groups interested in this condition including; Breed Clubs, Owners and Veterinary professionals. 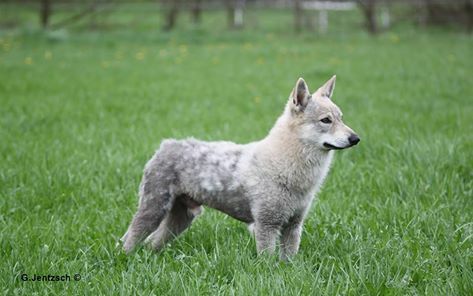 Ewa's fist experience of pituitary dwarfism began in 2010 with her two Czechoslovakian Wolfhound pup's Valerosa and Carinoso. In Poland little was known about this condition so Ewa contacted the University of Utrecht for advice. ﻿“Our Special Man” was born a Pituitary Dwarf and actually died twice within the first week of his life (revived with the kiss of life). He was helped with SC fluids and meds hence he was called “Spencer” in honour of Karen Spencer who helped with this little life! He lived quite happily with us here at Brayline without any major health concerns except those of a dwarf. I am sure he thought he was a normal big German Shepherd as he wasn’t afraid of anything or anyone. Even though he didn’t like visitors from when he was about 12 months old, he absolutely loved his family. Spencer travelled to Victoria with us for the GSDCA Nationals when he was only a few months old. I didn’t see much of him at the dog show as everyone thought he was just the cutest little thing and spent most of the time with friends at the show being cuddled and carried around. He was certainly the hit of the show!!! his Piggy Piggy) and would sit up at the kitchen bench on the stool whilst you were cooking dinner for his little titbits! Unfortunately we always were under the opinion in his later life that things were not at all good inside his brain as he started to become aggressive on occasions. This was managed in the house to protect family members quite successfully. He never ever went to go at me until the last couple of weeks before we had to make the decision to send him to “Rainbow Bridge”. The grieving process has been extremely hard as I have felt so guilty sending him to Rainbow Bridge earlier than he would have liked. His health was fairly good and when Spencer was having a good day he was the “most” loving dog I have ever had the pleasure of sharing my life with. The emptiness of the house is haunting me as there are no extra special greetings when I arrive home.